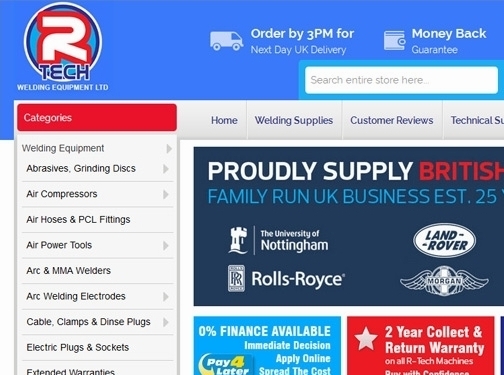 R-Tech Welding Equipment Ltd supplies a selection od MIG and TIG welders, as well as laser cutters to professionals and amateurs across the UK. They also supply all the associated products needed, from gas bottles to safety wear. UK (Gloucester) based business - established over 25 years ago - providing welding supplies. Website includes e-commerce facilities, testimonials (via ekomi), delivery and returns information, terms and conditions, full contact information including company registration and VAT numbers.